This interesting surname is a patronymic of Adam, which is of English origin, and is from the Hebrew personal name "Adam", which was borne, according to Genesis, by the first man. The name is of uncertain etymology; however, it is often said to be from the Hebrew "adama", earth. It was very popular as a given name among non-Jews throughout Europe in the Middle Ages. The personal name was first recorded in England with one "Adam Warenarius " in Lincolnshire in 1146 - 1153. 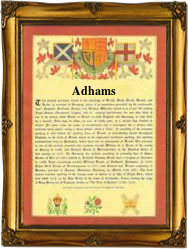 The surname development since 1281 (see below) includes the following: John Adamsone (1296, Scotland), William Adames (1327, Worcestershire) and Richard Adamessone (circa 1400, Norfolk). The second president of the United States, John Adams (1735 - 1826), and his son John Quincy Adams (1767 - 1848), who became the sixth president, were descended from Henry Adams, a yeoman farmer who had emigrated from Barton St. David, Somerset, to Massachusetts (United States of America) in 1640. Among the recordings in London is the marriage of Robert Adams and Jane Stanton on September 25th 1573 at St. Dunstan's, Stepney. The first recorded spelling of the family name is shown to be that of Alianor Adam, which was dated 1281, witness in the "Assize Rolls of Cheshire", during the reign of King Edward 1, known as "The Hammer of the Scots", 1272 - 1307. Surnames became necessary when governments introduced personal taxation. In England this was known as Poll Tax. Throughout the centuries, surnames in every country have continued to "develop" often leading to astonishing variants of the original spelling.